Gratitude is a choice. If we fail to chose it, by default we choose ingratitude. And once allowed into the heart, ingratitude does not come by itself but with a lot of other seedy companions that only succeed in stealing joy. To not choose gratitude - daily and deliberately - is more costly than we usually realize. And when we do choose a lifestyle of heartfelt, humble gratitude, we are mindful of the benefits received from our gracious Savior and those He has placed around us. By intentionally thanking God and others, bitterness and entitlement are replaced with joy and the humble realization of just how undeserving we really are. 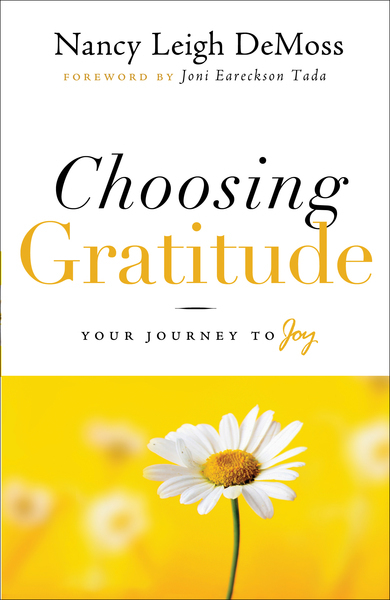 Derived from a popular Revive Our Hearts radio series, Choosing Gratitude: Your Journey to Joy challenges and equips the reader to live a life of intention. A life based on thankfulness - for the freedom Christ has provided and for the blessings of others. As a bonus, a 30-day plan of journaling, prayer and activities to help the reader on her path to joy is included.